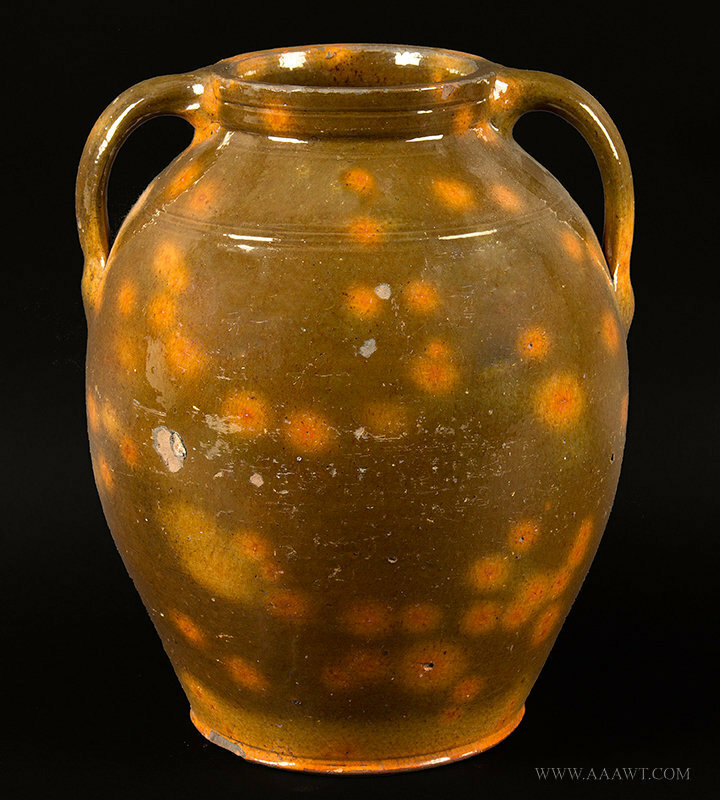 Olive green glaze with orange halos, great original condition, beautifully potted! 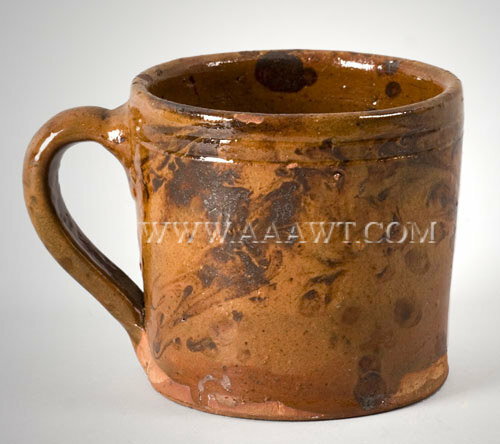 A finely thrown and glazed lead and manganese glazed open-handled redware mug featuring an applied, ridged and tapering strap handle; slightly flared rim; a fine rib is above the projecting foot. 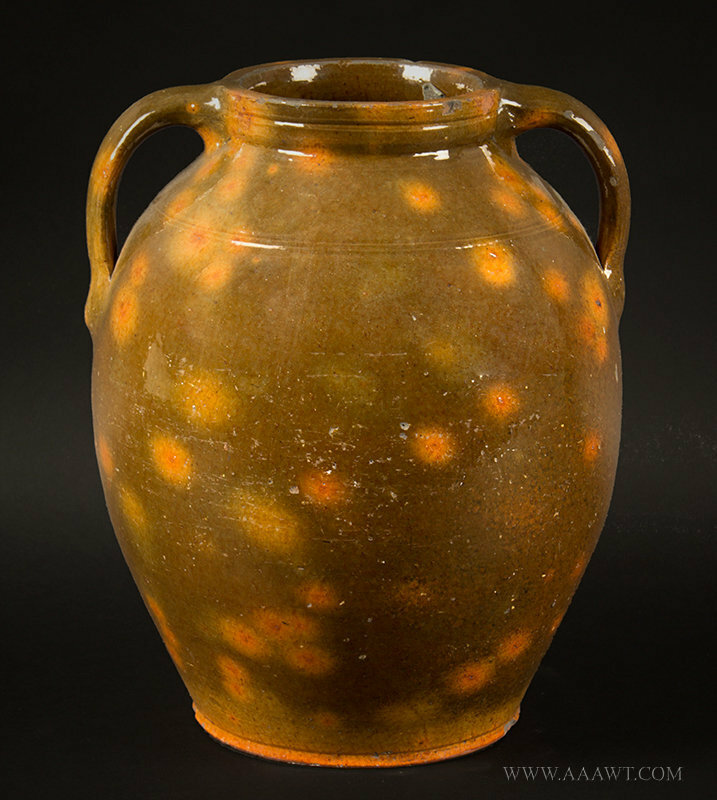 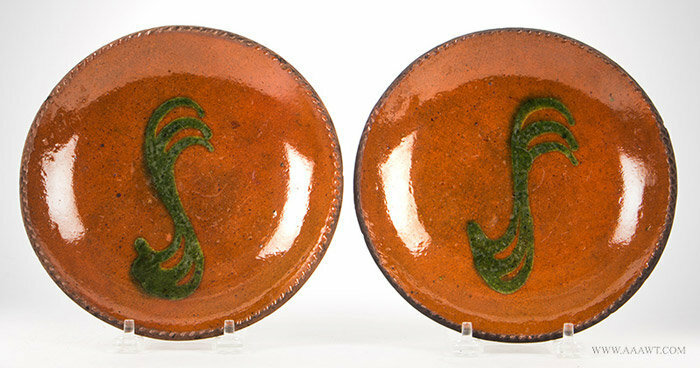 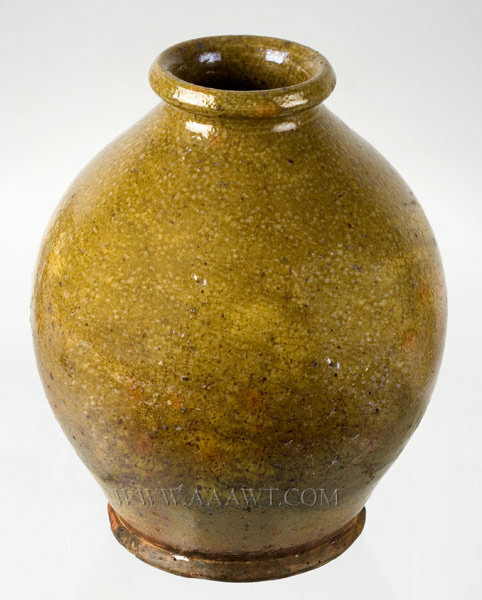 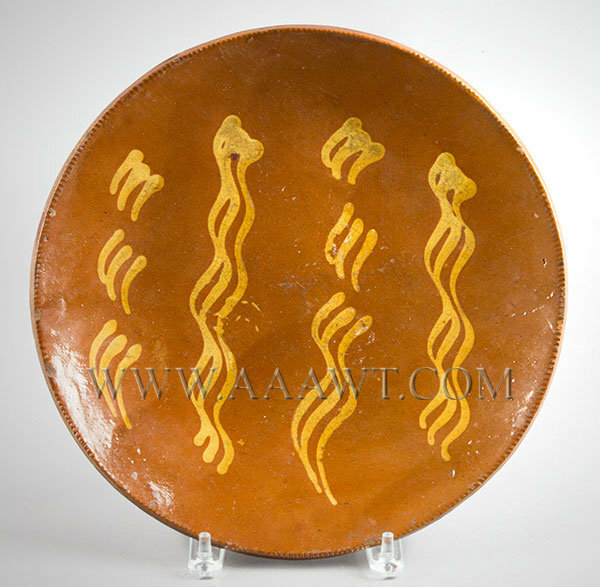 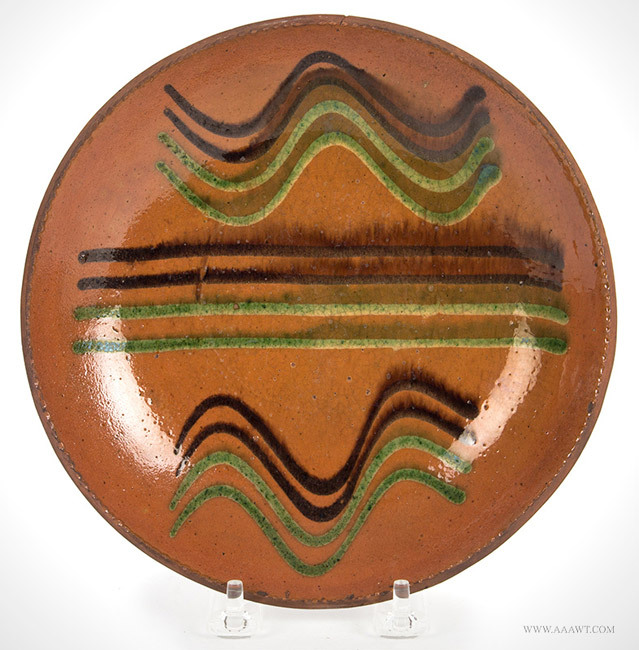 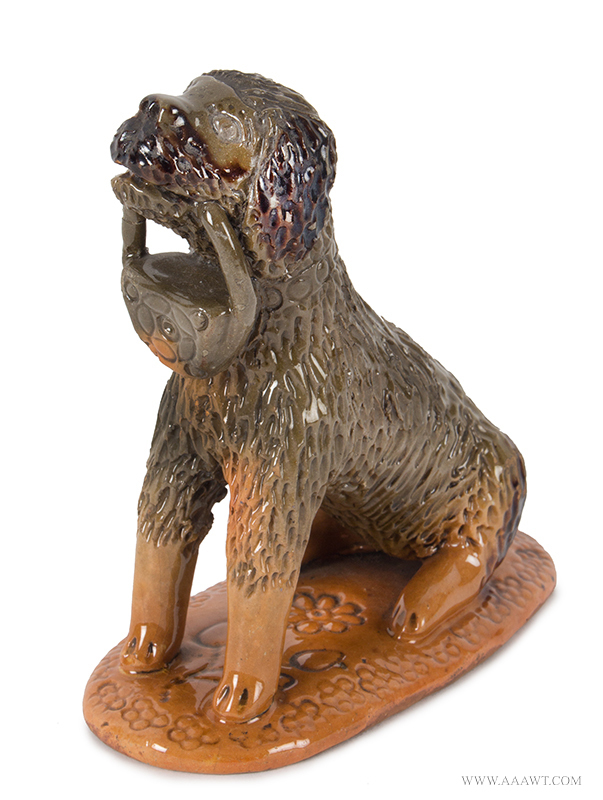 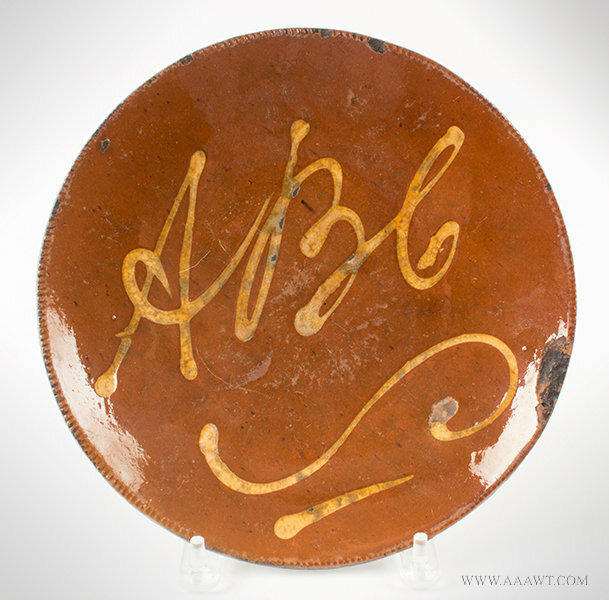 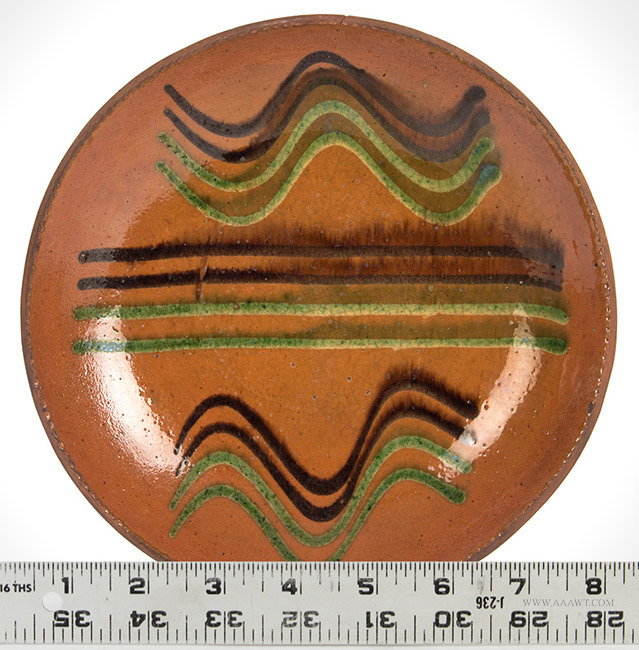 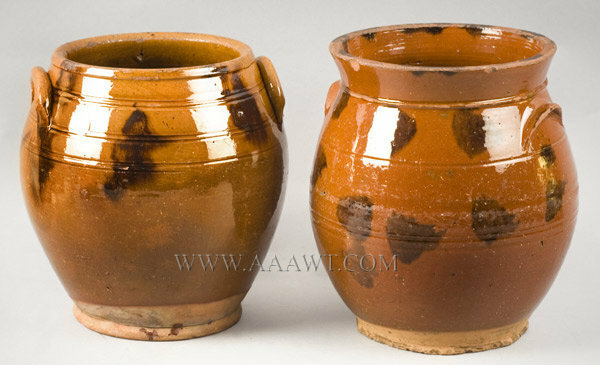 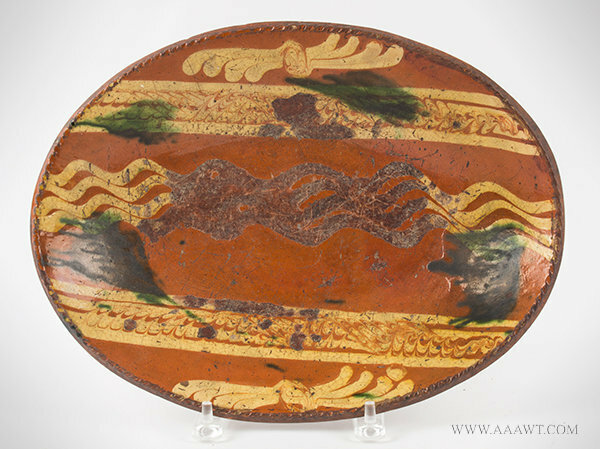 Decorated with splashes of manganese and a clear lead glaze; surface is colored an attractive dark green displaying orange spots with brown highlights. 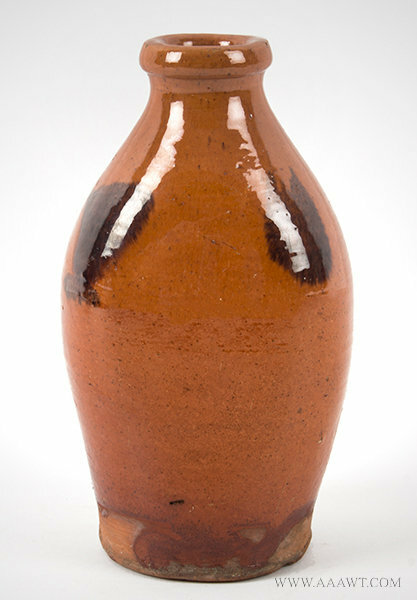 Height; 5.25". 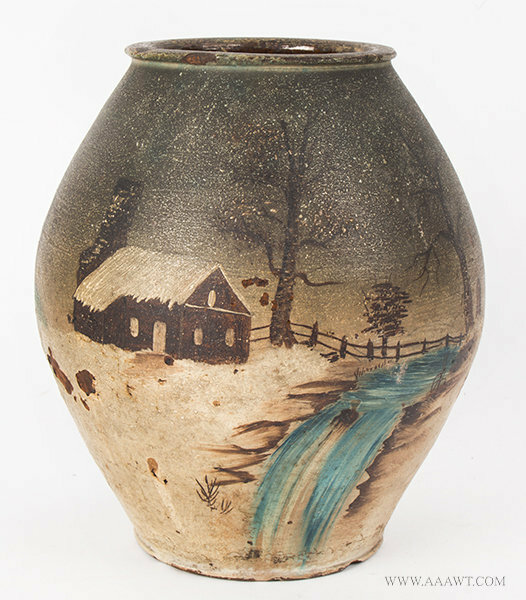 See Norwalk Potteries by Andrew and Kate Barber Winton, page 5, plate 5; discussed on pages 6 and 7. 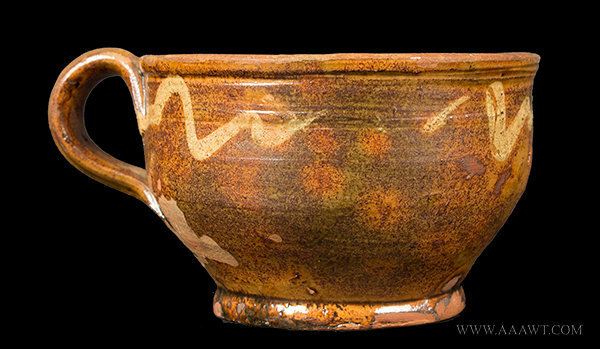 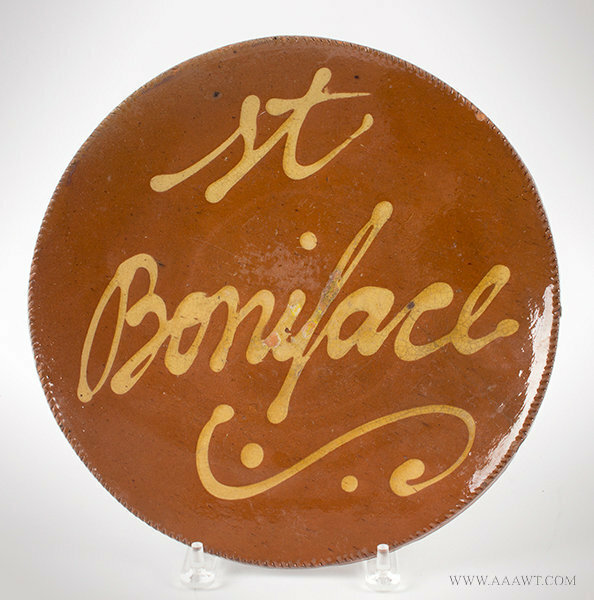 Large barrel shaped mug with handle having three hoops above and below incised lettering; brown and gold glazes, H: 5.75"; (some minor glaze flakes and wear to high spots, all else excellent). 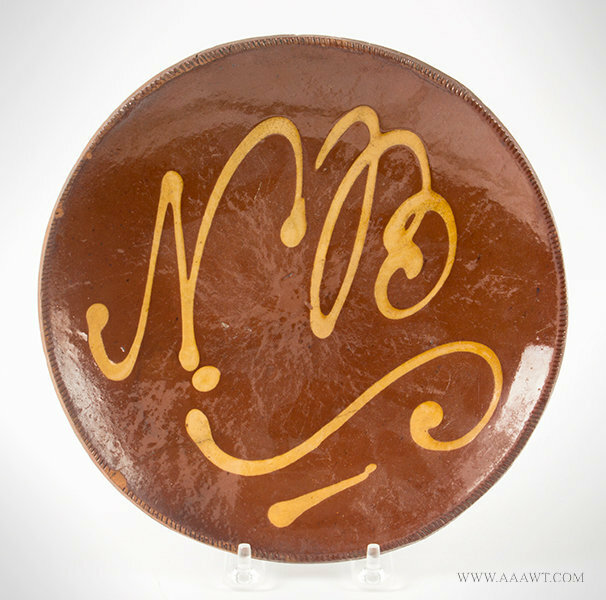 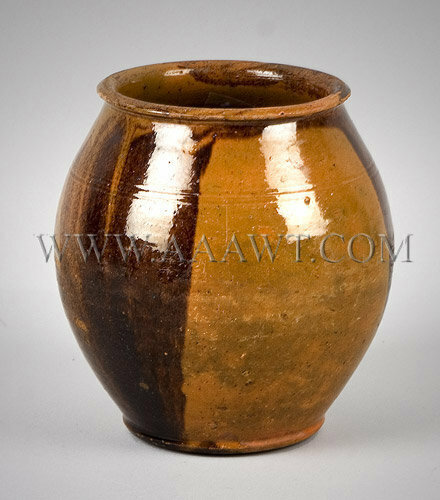 Dimensions: 7.75" H, 5.5" base diameter. 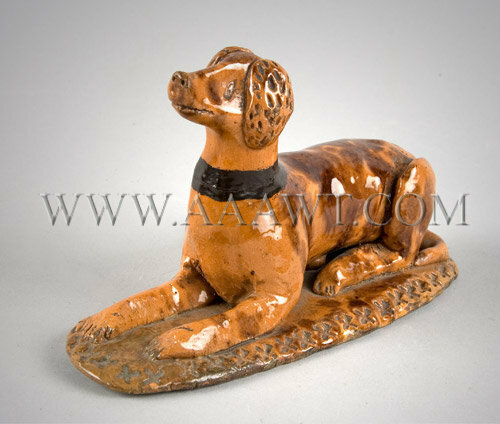 Applied lug handles, tooling beneath collar, shoulder and belly. 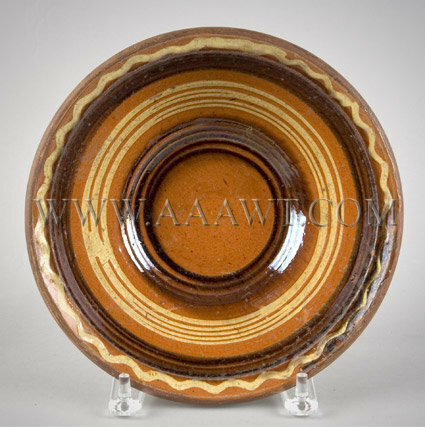 Ribbed handle, incised concentric rings; rim chips. 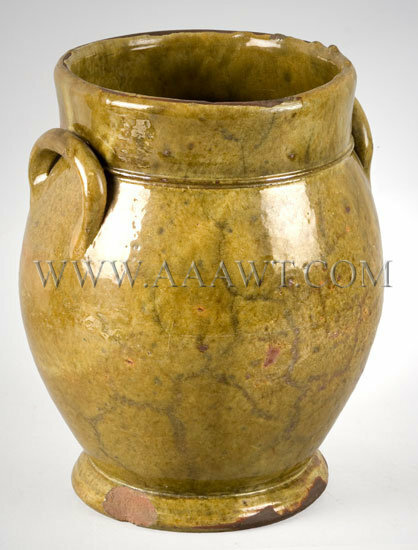 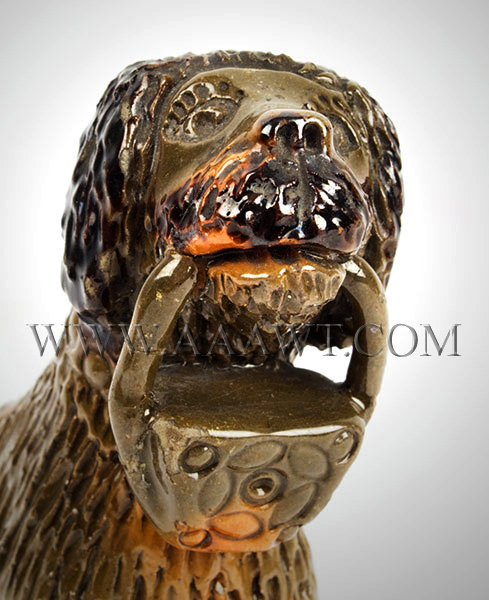 Strap handle with tooling, incising; rim ware. 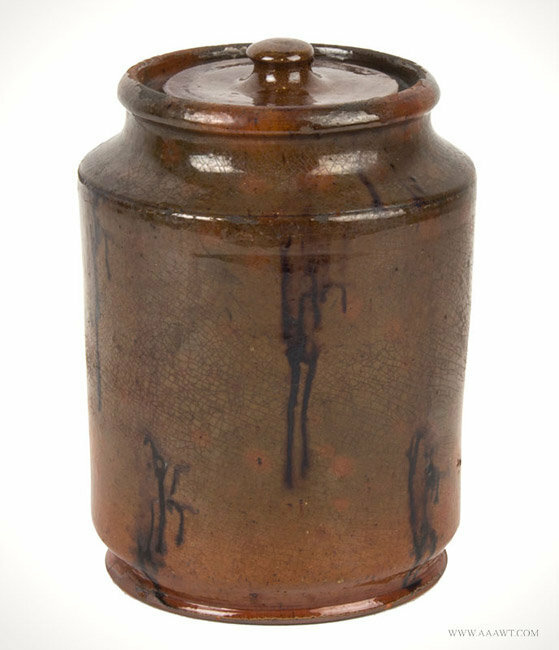 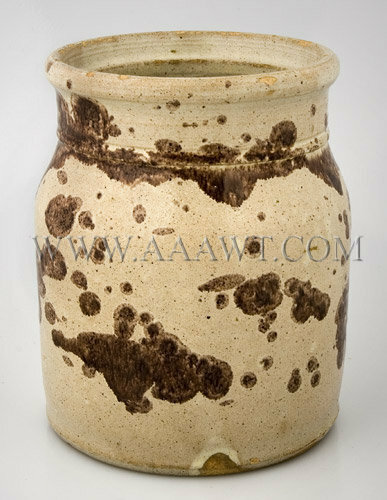 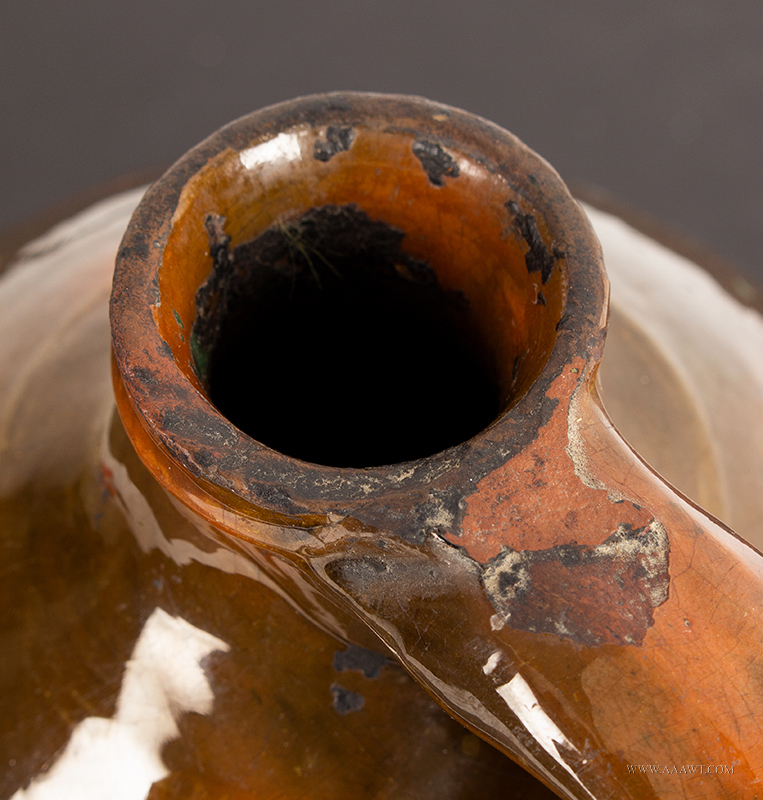 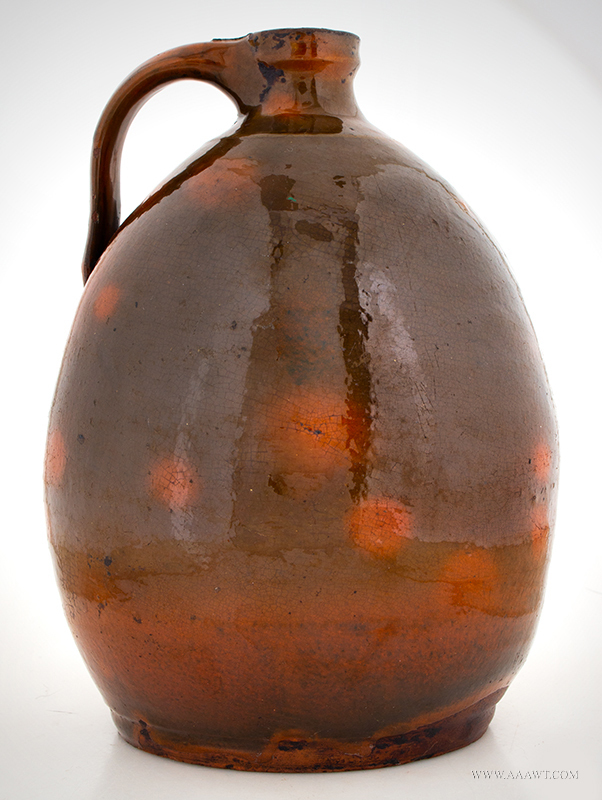 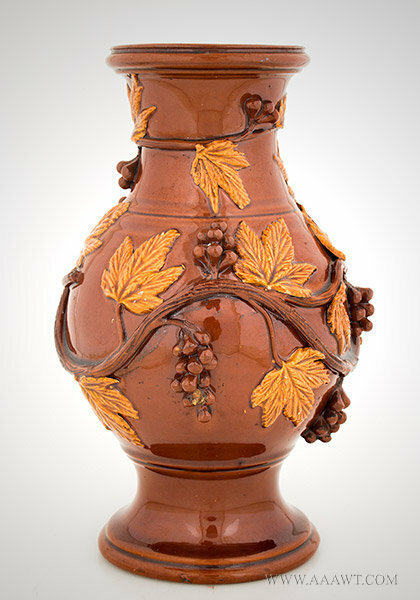 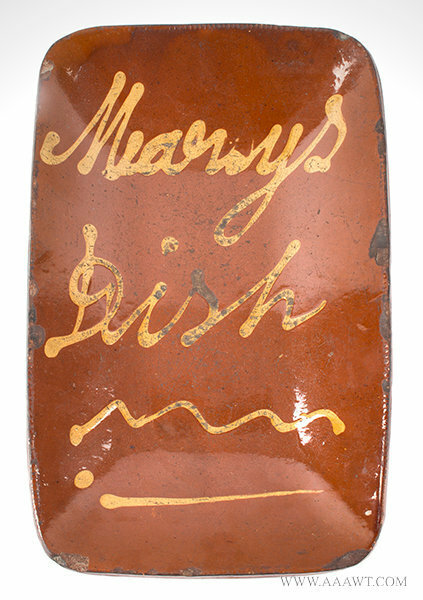 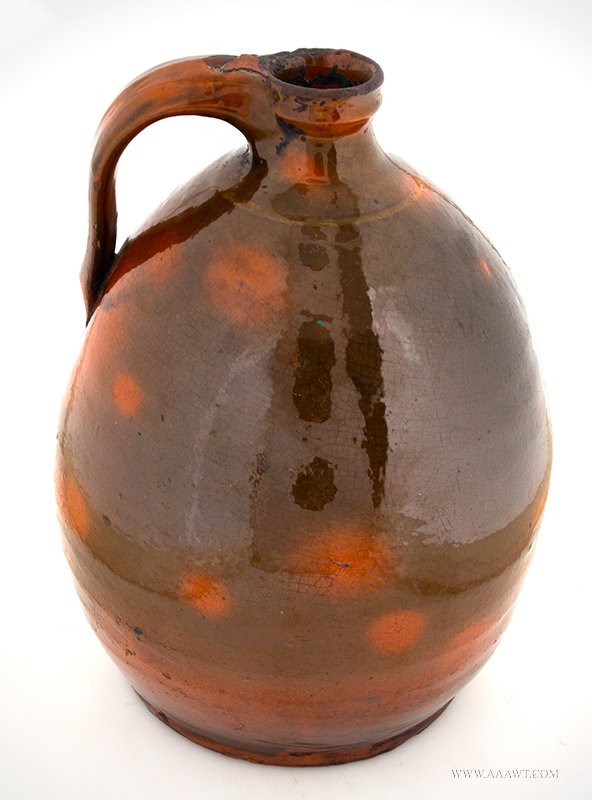 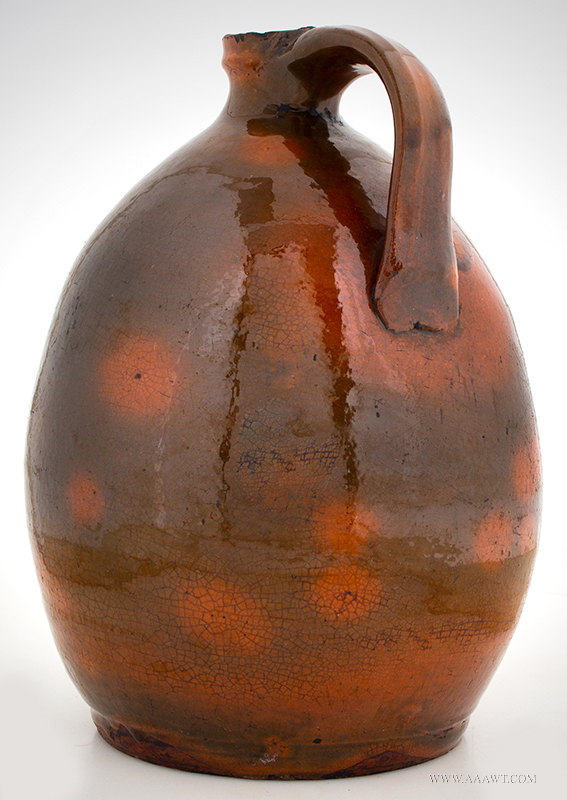 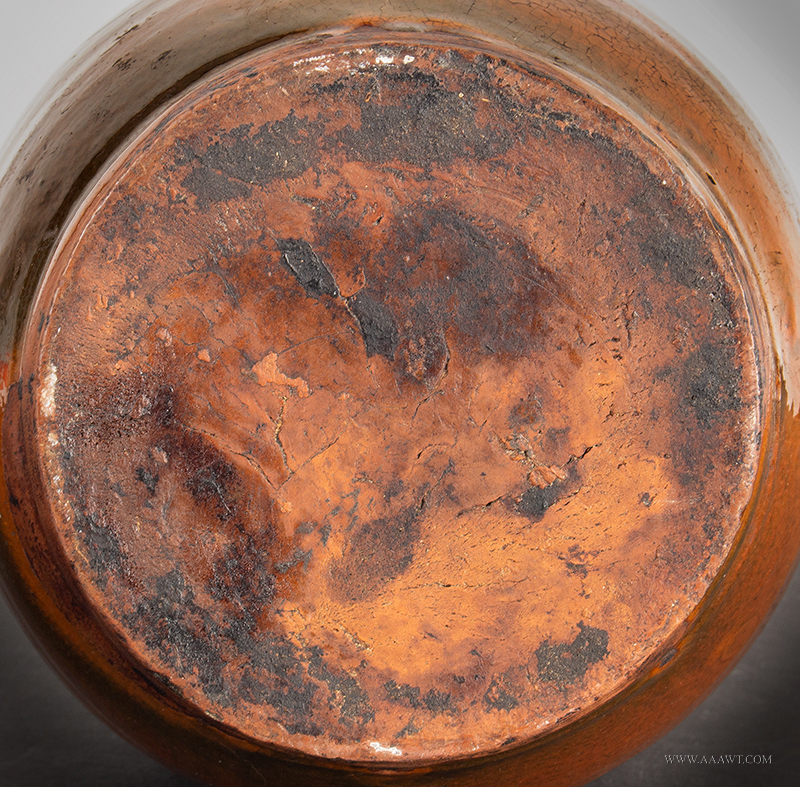 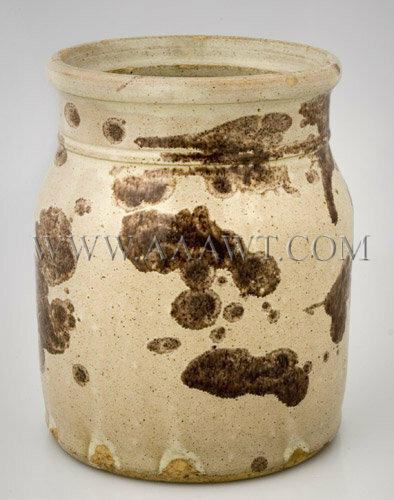 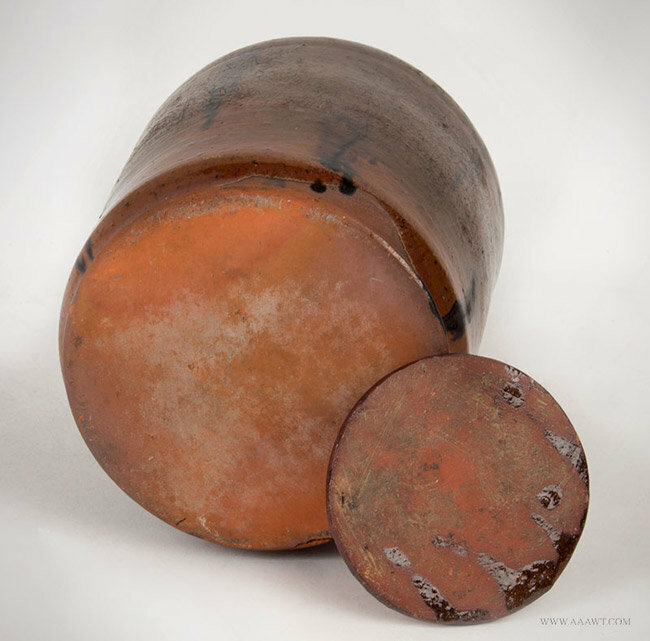 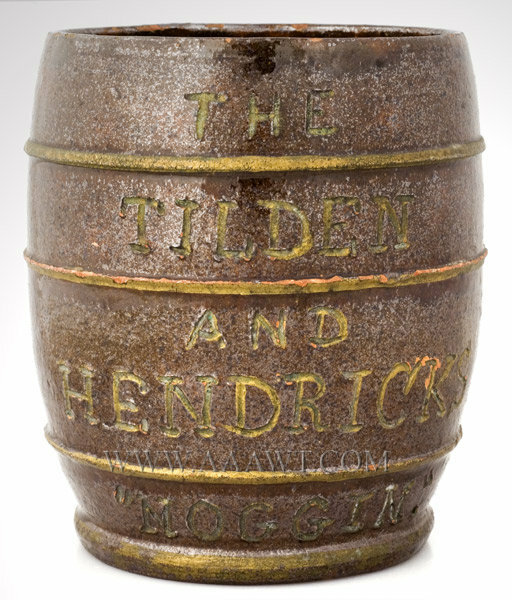 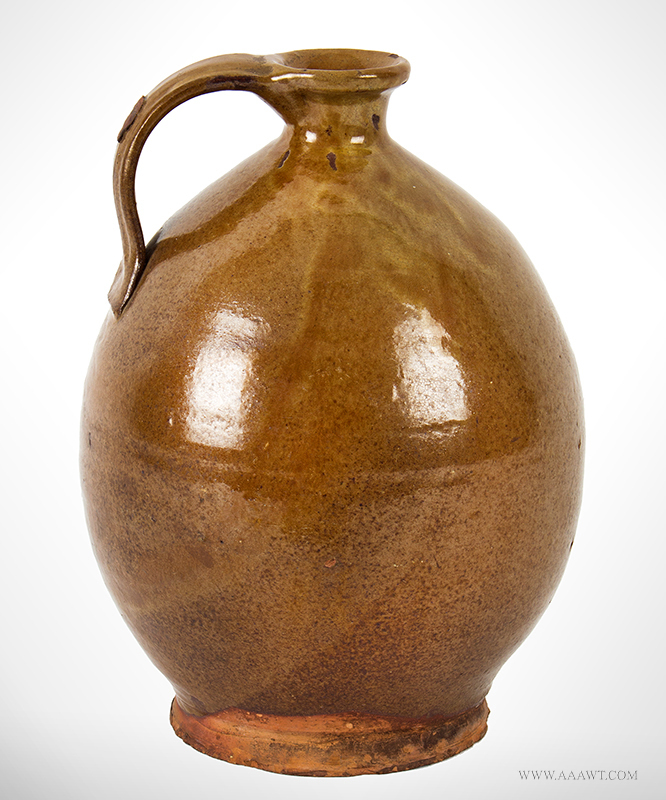 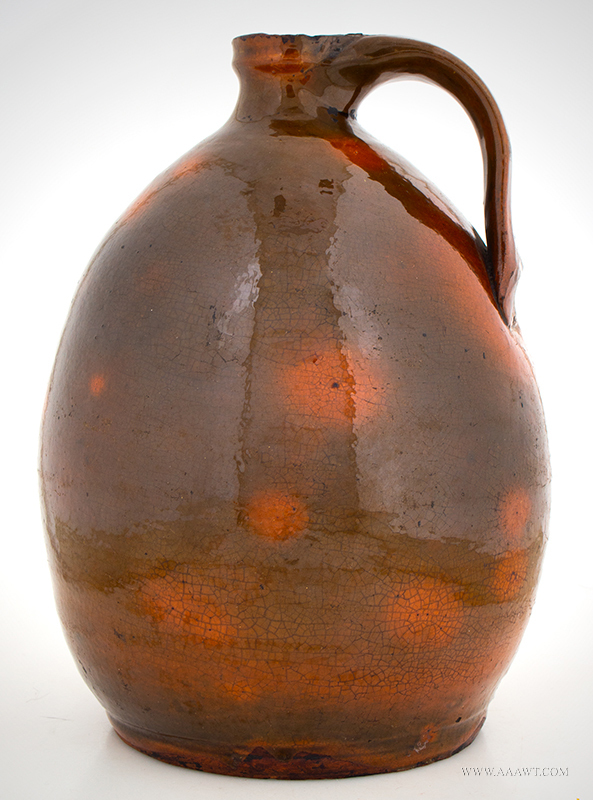 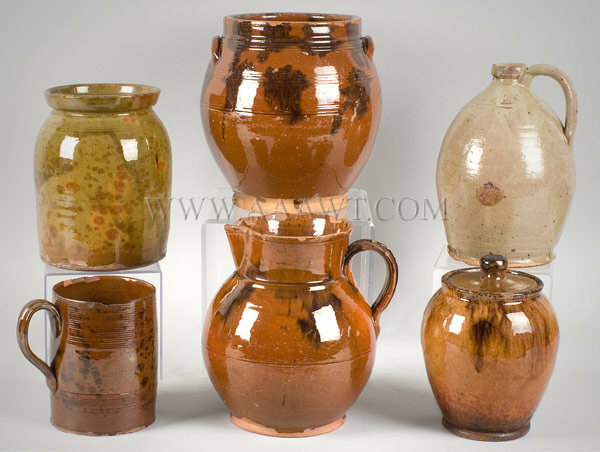 As depicted, a nicely potted jar with incised shoulder; manganese splotches and drips. 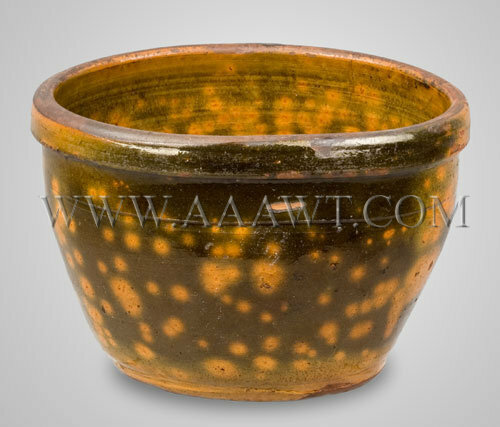 In excellent condition, with only very minor glaze-frittering on rim. 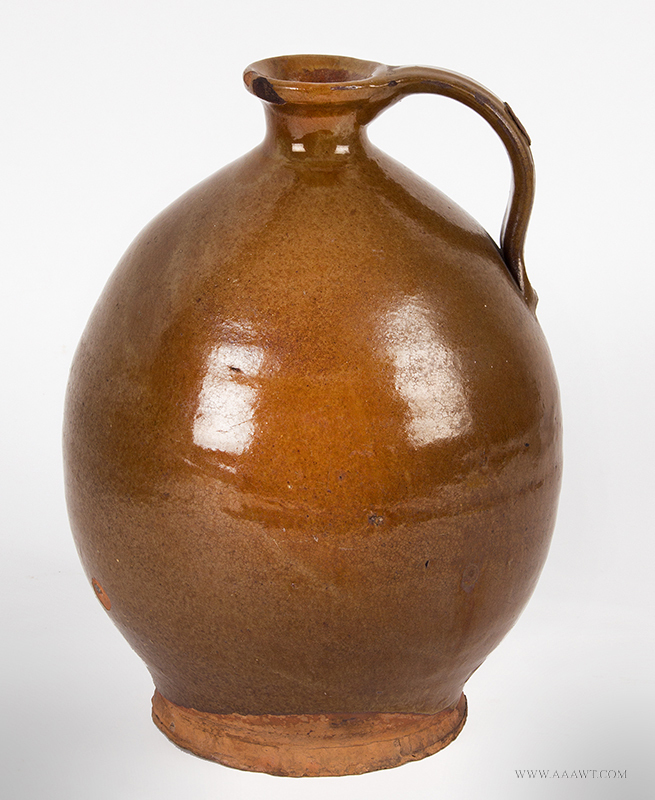 Dimensions: 10.25" high. 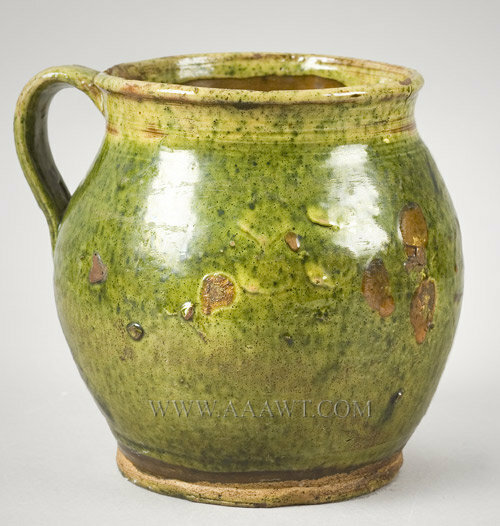 As depicted, nicely potted jar with applied handles, and thick pea soup green glaze. 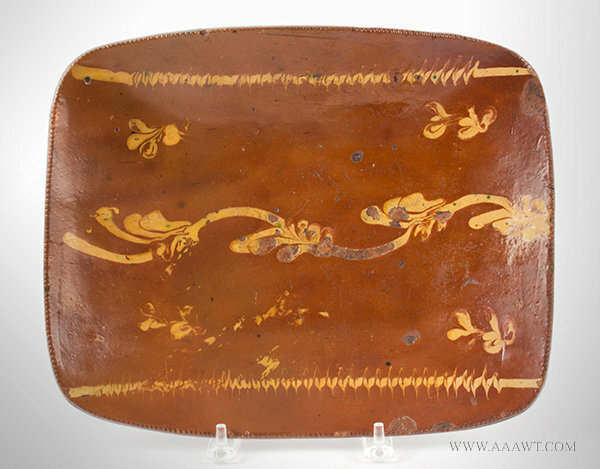 The piece remains in excellent condition with one chip on foot. 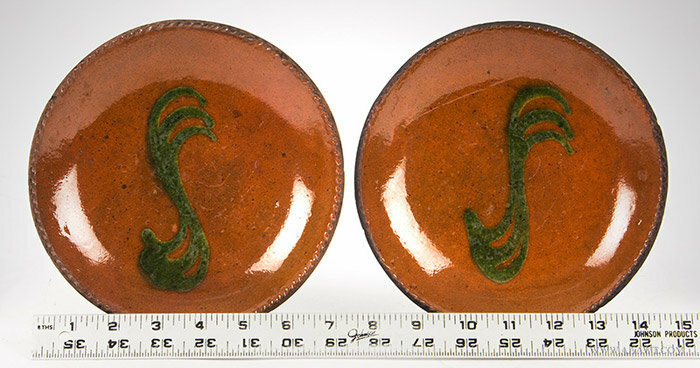 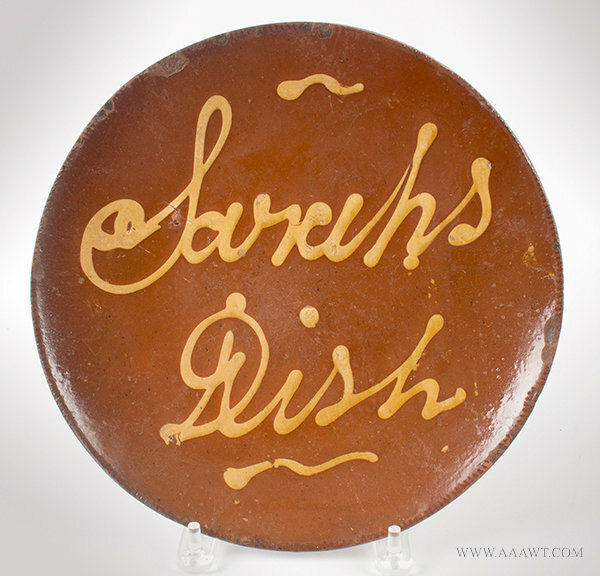 Dimensions: 9.75" high. 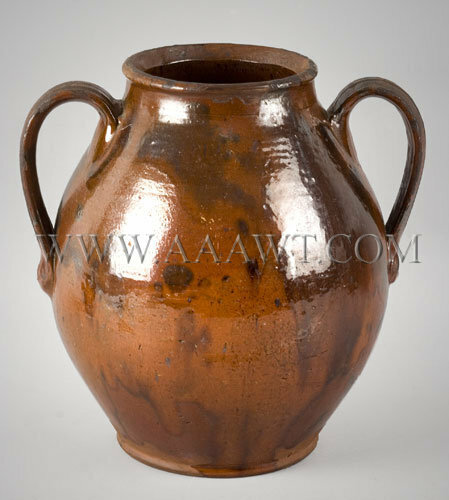 As depicted, nicely potted with applied wide strap handles that are quadruple incised and have "pinky" impressed terminus ornamentation. 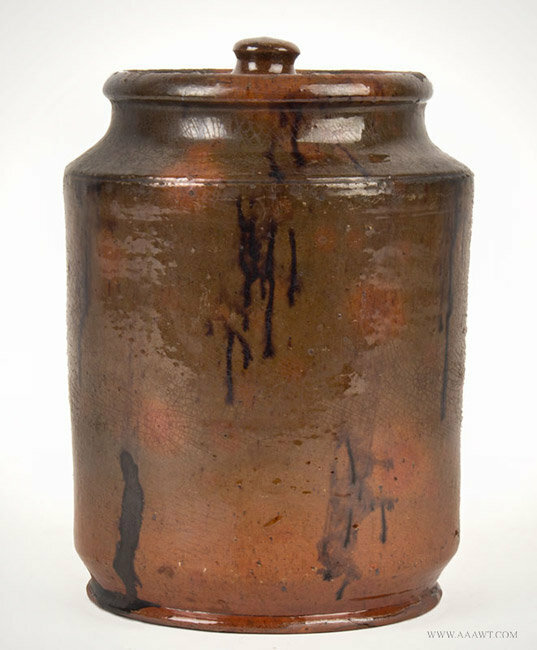 The jar, standing at 10.5" remains in good condition. 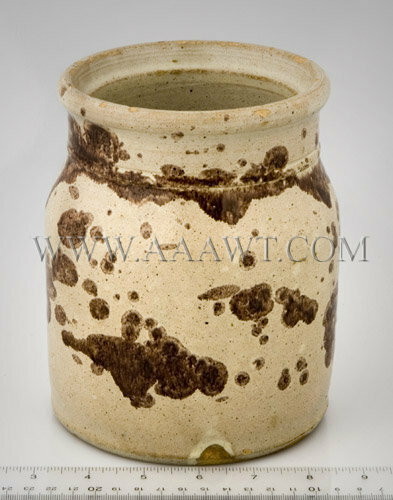 Semi-ovoid jar with tooled shoulder and wide rim; interior and exterior covered in glaze. 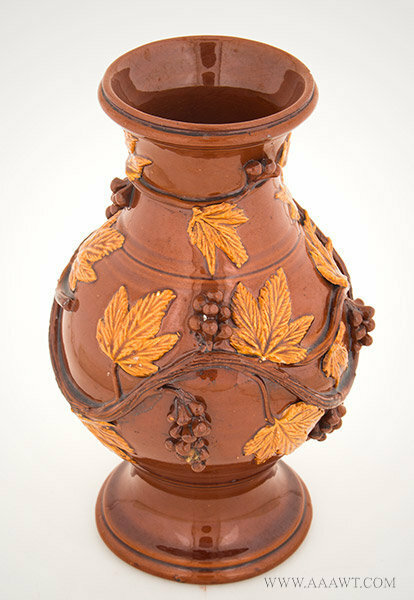 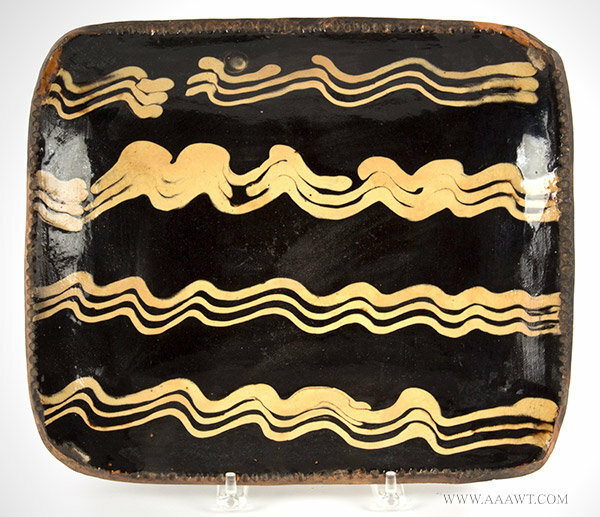 This pot is somewhat out-of-round and is in excellent original condition. 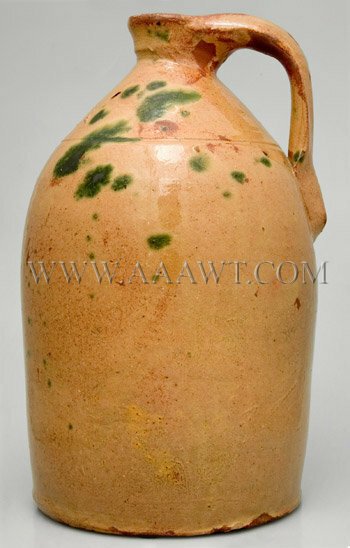 A pinkish tan glaze with heavy green splotches. 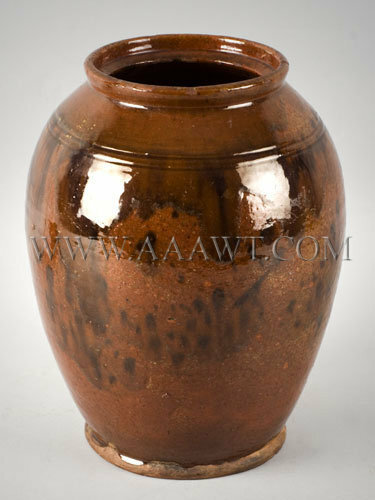 There are three small chips on the side of spout and a "pot stone" blowout under the handle otherwise good condition and good looking. 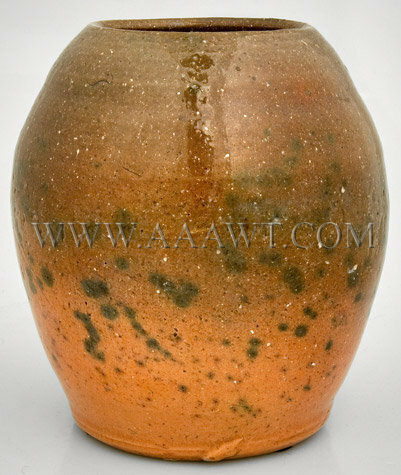 Height 9".